For me, yoga has always been a linking of movement & breath that allows me to drop out of my anxious mind & into the moment, where anything is possible. It seems there’s more magic in the present moment, there’s more to be grateful for, and yoga is one of the ways we can access that. It’s also like a reset button for the body – patterns we are trying to break (body patterns & mental patterns) that are painful or useless – it does that. I was 13 and I was experiencing digestive issues, an eating disorder, and anxiety. I was in & out of Children’s Hospital for years. Then one of my specialists suggested I try yoga for pain management. I went every day for two weeks, and after those two weeks, I was like a different person. My mom says it was like when I came out of class, I was in a peaceful trance. Eventually that changed my body & my mind – I recovered. I finished my yoga teacher training by the time I was 15. I was fortunate enough to train with Nikki Myers in Yoga for 12 Step Recovery, and since that training I follow Nikki’s classes & talks whenever I can. She has this amazing way of making very basic yoga sequences VERY powerful and transformative. 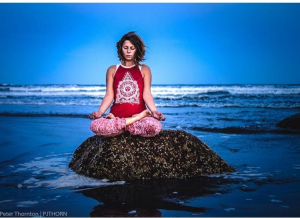 She introduced to me a way of thinking about movement for breaking old patterns that I hadn’t come across anywhere else in 10 years of practicing, and her work is making a big difference on a nationwide problem, which is such an important way for yoga to be utilized. To be honest, I have been on this path for so long I don’t really remember what my life was like before I was a yoga teacher & can’t imagine living without it. But what keeps me inspired is that every once in a while, a new student will come to class – and after class will tell me how one thing I said or one movement we did really affected them. They’re almost glowing when they leave. This happens a lot in my teen classes I teach at South Portland High School, which is especially awesome since that’s when yoga helped me most. It reminds me how important it is that we keep spreading this practice. The teacher that I did my training program with talked about what “posture” you take in the world – always try to take a loving, relaxed, open posture. So whenever I am in a situation and notice I am creating tension – I try to be kinder to myself & others, I try to let go of what I can, soften where I can, and release control. There’s not many situations where letting go a little bit – physically & mentally – can have a tremendous benefit. 6. DO YOU HAVE A ROUTINE OR RITUALISTIC WAY TO STARTING EACH DAY? IF SO, PLEASE DESCRIBE. What keeps me in line is waking up, making coffee, making lunch for my partner to take to work, and then sitting in front of my altar to meditate. It feels good for me starting the day to do a little caring, kind act for someone I love and appreciate- and then to take some time to love & appreciate myself. As humans, sometimes we find ourselves unable to say “no” or – alternately – focusing too much on our selves & forgetting to give sometimes. I fall on the side that has a hard time saying no, so I’ve been making it a point to pass up on teaching opportunities or doing things for others that interfere with my own practice time, reading/journaling, or meditating time. Working on finding this balance has kept me from feeling depleted and helps me to give more fully & authentically when I do have the opportunity. 7. WHAT DRAWS YOU TO THE LILA COMMUNITY? The authenticity and passion of it. There are lots of studios out there that are trying to find their identity based on what’s popular; Lila doesn’t do that. 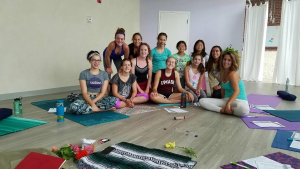 It has an identity dedicated to the simplicity & power of the tradition of yoga, and it provides a fun, calm, and supportive environment for it. Everyone seems to be there because yoga means something to them & their lives. That’s powerful to me. 8. IF YOU WOULD SUGGEST ONE BOOK TO THE COMMUNITY TO READ AS AN OPPORTUNITY TO DEEPEN THEIR LEARNING ON LIFE, YOGA, AND ALL THINGS, WHAT WOULD IT BE? “The Places that Scare You” by Pema Chodron. This was the first yoga/self-help/spirituality book I read, and I refer back to it all the time ever since. It kind of helped me understand why all this stuff is so important; why it’s so important to be able to sit in the uncomfortable stuff (like pigeon pose, or a painful life experience). In our practice & our life, it’s the same. And it makes maneuvering the tough things easier.